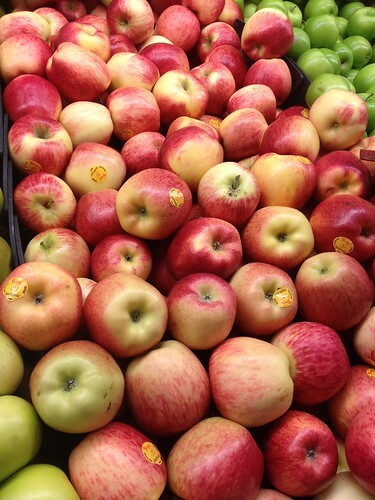 The other great part about Autumn is that apples are in season. While my orchard apple trees are pretty much done for the season, there are still fresh crunchy apples appearing at the supermarkets and markets. This week I came home with Lemonade, Ambrosia & Braeburn apples. 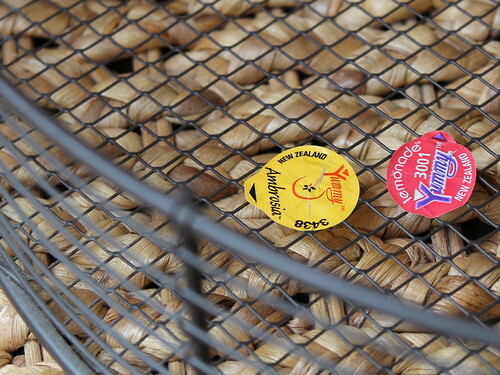 I could have also purchased Ballarat, Granny Smith, Royal Gala and something else…. a relation of the NZ Rose apple I believe. I didn’t pay too much attention as NZ Rose is not an apple we enjoy though I have been told they are delicious when you eat them at their best. Obviously I’ve not figured out when they are at their best so we leave them alone. There are other apples I’d rather eat. Lemonade apples we have had before and I have written about here. I have since learned that the Lemonade is a Braeburn Royal Gala hybrid. I have also learned that a hybrid is a (human) controlled cross-pollination between two different apple varieties and that a Braeburn Royal Gala cross-pollination can result in a lot of different hybrids much like two parents producing multiple children with different traits and genes from each parent and some similarities (Miss M has her great-grandfather’s bobble nose, luckily she doesn’t have his elfen ears as well). 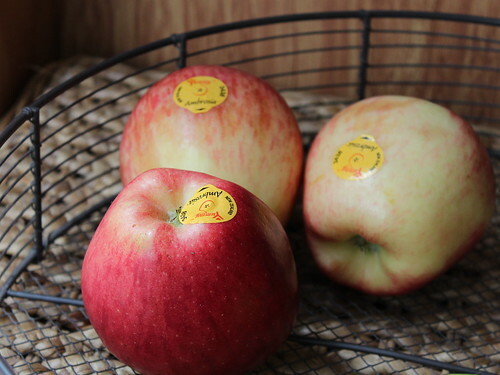 The Jazz, Envy, Genesis & Lemonade are all Braeburn Royal Gala hybrids and yet they are all very different apples. The Royal Gala is a red-skinned natural mutation of the Gala apple. Gala parentage is Golden Delicious & Kidd’s Orange Red while the Braeburn parentage is believed to be Lady Hamilton & unknown (though Wiki identifies the unknown as Granny Smith). The family tree of apples means a Lemonade apple has Golden Delicious, Kidd’s Orange Red, Lady Hamilton & Granny Smith (maybe) as grandparents which helps explain why the cross-pollination of two apples can have so many varied offspring. Sometimes when tasting an apple singularly the flavours are hard to pick out. When tasting two apples side by side, bite for bite, the flavours are much more pronounced. This time when eating the Lemonade I could detect faint lemon tones but still didn’t consider the apple very tart. Then I had a bite of the Ambrosia which is honey-sweet. Compared to the Ambrosia, a Lemonade apple is quite tart after all. Last week, the Anster told me not to buy Ambrosia apples as he didn’t like them. I hadn’t had a chance to taste them so I decided to ignore his instruction and I came home with three of them. I am so glad I did. I cut one of each (an Ambrosia & a Lemonade) into quarters and gave a quarter each to the Anster to try – he knew what the Lemonade apple was (they are a very distinctive shape and not many apples have such greeny-yellow skin) but he didn’t know what the Ambrosia was. His preference was the Ambrosia, so much for not liking them but when eaten alongside a Lemonade, the Ambrosia is very full flavoured. It has a perfumed aromatic flavour, almost like stewed apple but with the crunch of a very fresh apple. He was most surprised it was an Ambrosia as the others in the fruit bowl he hadn’t enjoyed. Perhaps they aren’t so good at room temperature. The Ambrosia apple hails from BC, Canada. It is thought to be the offspring of a Golden Delicious and a Jonagold or Starking Delicious. Orange Pippin notes it is quite similar to a Golden Delicious and I’d have to agree that the flavour is as good as a tree-ripened freshly picked Golden Delicious. The Jonagold is an offspring of the Golden Delicious and Jonathon so if Jonagold is indeed a parent of the Ambrosia then it has a double helping of Golden Delicious (apparently it is OK for apples to have the same parent & grandparent). The Starking Delicious is a natural sport of the original Delicious (of which Red Delicious is another sport & therefore a sibling to the Starking Delicious). 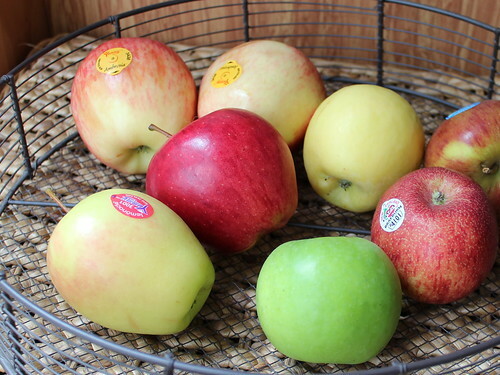 Red Delicious and Golden Delicious are not thought to be connected although the Golden Delicious has unknown parentage. But enough of family trees and ancient applely ancestors…… both the Ambrosia and Lemonade apples have earned their place in our fruit bowl. 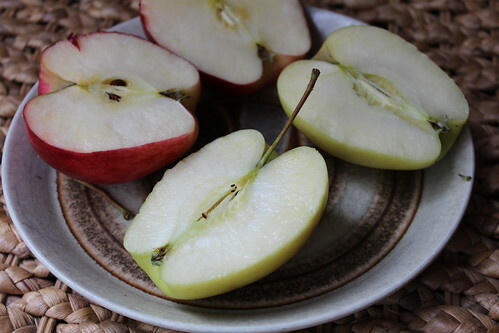 I prefer the Ambrosia which surprises me a little as Braeburn apples and it’s hybrids, sports and natural mutations are very high on my list of favourite apples (refer here to read my ravings about the Mahana Red apple). So for a non-Braeburn apple to push out a Braeburn relative speaks very highly of that apple. Ambrosia gets two ticks from me. On a slightly different note – the Ambrosia apples are very slow to brown (oxidise) making them an ideal apple for salads. This entry was posted in Apple Varieties and tagged Ambrosia, Lemonade by Jo Dohrman. Bookmark the permalink.